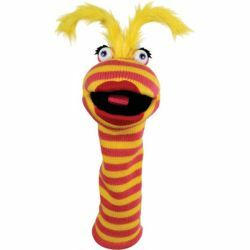 With their brightly colored stripes, large moving mouths, squeakers and tons of personality, " Knitted Glove Puppets" are excellent for play or puppet theaters. Puppets encourage children to be creative, use their imagination to tell exciting stories, to bring fairy tales to life, to entertain and have fun. Average height of 16".